With the launch of a new US-led war in Iraq and Syria against the Islamic State (IS), the United States has engaged in aggressive military action in at least thirteen countries in the Greater Middle East since 1980. In that time, every American president has invaded, occupied, bombed or gone to war in at least one country in the region. The total number of invasions, occupations, bombing operations, drone assassination campaigns and cruise missile attacks easily runs into the dozens. In the Persian Gulf alone, the United States has major bases in every country save Iran. There is an increasingly important, increasingly large base in Djibouti, just miles across the Red Sea from the Arabian Peninsula. There are bases in Pakistan on one end of the region and in the Balkans on the other, as well as on the strategically located Indian Ocean islands of Diego Garcia and the Seychelles. In Afghanistan and Iraq, there were once as many as 800 and 505 bases, respectively. Recently, the Obama administration inked an agreement with new Afghan President Ashraf Ghani to maintain around 10,000 troops and at least nine major bases in his country beyond the official end of combat operations later this year. US forces, which never fully departed Iraq after 2011, are now returning to a growing number of bases there in ever larger numbers. In short, there is almost no way to overemphasize how thoroughly the US military now covers the region with bases and troops. This infrastructure of war has been in place for so long and is so taken for granted that Americans rarely think about it and journalists almost never report on the subject. Members of Congress spend billions of dollars on base construction and maintenance every year in the region, but ask few questions about where the money is going, why there are so many bases and what role they really serve. By one estimate, the United States has spent $10 trillion protecting Persian Gulf oil supplies over the past four decades. Approaching its thirty-fifth anniversary, the strategy of maintaining such a structure of garrisons, troops, planes and ships in the Middle East has been one of the great disasters in the history of American foreign policy. The rapid disappearance of debate about our newest, possibly illegal war should remind us of just how easy this huge infrastructure of bases has made it for anyone in the Oval Office to launch a war that seems guaranteed, like its predecessors, to set off new cycles of blowback and yet more war. After thirty-five years of base-building in the region, it’s long past time to look carefully at the effects Washington’s garrisoning of the Greater Middle East has had on the region, the United States and the world. With these words, Carter launched one of the greatest base construction efforts in history. He and his successor Ronald Reagan presided over the expansion of bases in Egypt, Oman, Saudi Arabia and other countries in the region to host a “Rapid Deployment Force,” which was to stand permanent guard over Middle Eastern petroleum supplies. The air and naval base on Diego Garcia, in particular, was expanded at a quicker rate than any base since the war in Vietnam. By 1986, more than $500 million had been invested. Before long, the total ran into the billions. Soon enough, that Rapid Deployment Force grew into the US Central Command, which has now overseen three wars in Iraq (1991–2003, 2003–11, 2014–); the war in Afghanistan and Pakistan (2001–); intervention in Lebanon (1982–84); a series of smaller-scale attacks on Libya (1981, 1986, 1989, 2011); Afghanistan (1998) and Sudan (1998); and the “tanker war” with Iran (1987–88), which led to the accidental downing of an Iranian civilian airliner, killing 290 passengers. Meanwhile, in Afghanistan during the 1980s, the CIA helped fund and orchestrate a major covert war against the Soviet Union by backing Osama Bin Laden and other extremist mujahidin. The command has also played a role in the drone war in Yemen (2002-) and both overt and covert warfare in Somalia (1992–94, 2001–). During and after the first Gulf War of 1991, the Pentagon dramatically expanded its presence in the region. Hundreds of thousands of troops were deployed to Saudi Arabia in preparation for the war against Iraqi autocrat and former ally Saddam Hussein. In that war’s aftermath, thousands of troops and a significantly expanded base infrastructure were left in Saudi Arabia and Kuwait. Elsewhere in the Gulf, the military expanded its naval presence at a former British base in Bahrain, housing its Fifth Fleet there. Major air power installations were built in Qatar, and US operations were expanded in Kuwait, the United Arab Emirates and Oman. The invasion of Afghanistan in 2001 and of Iraq in 2003, and the subsequent occupations of both countries, led to a more dramatic expansion of bases in the region. By the height of the wars, there were well over 1,000 US checkpoints, outposts and major bases in the two countries alone. The military also built new bases in Kyrgyzstan and Uzbekistan (since closed), explored the possibility of doing so in Tajikistan and Kazakhstan, and, at the very least, continues to use several Central Asian countries as logistical pipelines to supply troops in Afghanistan and orchestrate the current partial withdrawal. While the Obama administration failed to keep fifty-eight “enduring” bases in Iraq after the 2011 US withdrawal, it has signed an agreement with Afghanistan permitting US troops to stay in the country until 2024 and maintain access to Bagram Air Base and at least eight more major installations. 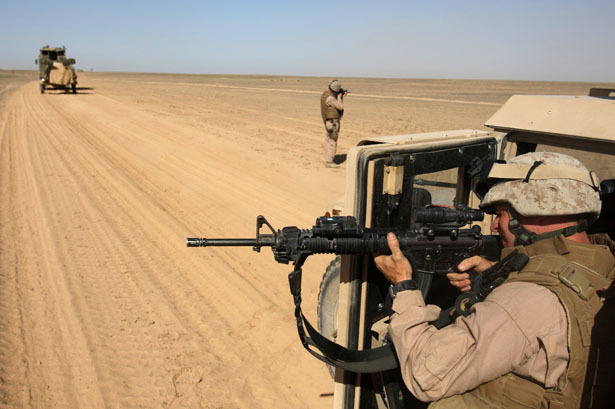 Even without a large permanent infrastructure of bases in Iraq, the United States military has had plenty of options when it comes to waging its new war against IS. In that country alone, a significant US presence remained after the 2011 withdrawal in the form of base-like State Department installations, as well as the largest embassy on the planet in Baghdad, and a large contingent of private military contractors. Since the start of the new war, at least 1,600 troops have returned and are operating from a Joint Operations Center in Baghdad and a base in Iraqi Kurdistan’s capital, Erbil. Last week, the White House announced that it would request $5.6 billion from Congress to send an additional 1,500 advisers and other personnel to at least two new bases in Baghdad and Anbar Province. Special operations and other forces are almost certainly operating from yet more undisclosed locations. At least as important are major installations like the Combined Air Operations Center at Qatar’s al-Udeid Air Base. Before 2003, the Central Command’s air operations center for the entire Middle East was in Saudi Arabia. That year, the Pentagon moved the center to Qatar and officially withdrew combat forces from Saudi Arabia. That was in response to the 1996 bombing of the military’s Khobar Towers complex in the kingdom, other Al Qaeda attacks in the region, and mounting anger exploited by Al Qaeda over the presence of non-Muslim troops in the Muslim holy land. Al-Udeid now hosts a 15,000-foot runway, large munitions stocks and around 9,000 troops and contractors who are coordinating much of the new war in Iraq and Syria. As a transparently promotional article in The Washington Post confirmed this week, al-Dhafra Air Base in the United Arab Emirates has launched more attack aircraft in the present bombing campaign than any other base in the region. That country hosts about 3,500 troops at al-Dhafra alone, as well as the Navy’s busiest overseas port. B-1, B-2 and B-52 long-range bombers stationed on Diego Garcia helped launch both Gulf Wars and the war in Afghanistan. That island base is likely playing a role in the new war as well. Near the Iraqi border, around 1,000 US troops and F-16 fighter jets are operating from at least one Jordanian base. According to the Pentagon’s latest count, the US military has seventeen bases in Turkey. While the Turkish government has placed restrictions on their use, at the very least some are being used to launch surveillance drones over Syria and Iraq. Up to seven bases in Oman may also be in use. Bahrain is now the headquarters for the Navy’s entire Middle Eastern operations, including the Fifth Fleet, generally assigned to ensure the free flow of oil and other resources though the Persian Gulf and surrounding waterways. There is always at least one aircraft carrier strike group—effectively, a massive floating base—in the Persian Gulf. At the moment, the USS Carl Vinson is stationed there, a critical launch pad for the air campaign against the Islamic State. Other naval vessels operating in the Gulf and the Red Sea have launched cruise missiles into Iraq and Syria. The Navy even has access to an “afloat forward-staging base” that serves as a “lilypad” base for helicopters and patrol craft in the region. Elsewhere in the region, the military has established a collection of at least five drone bases in Pakistan; expanded a critical base in Djibouti at the strategic chokepoint between the Suez Canal and the Indian Ocean; created or gained access to bases in Ethiopia, Kenya and the Seychelles; and set up new bases in Bulgaria and Romania to go with a Clinton administration-era base in Kosovo along the western edge of the gas-rich Black Sea. The ongoing US presence in Saudi Arabia, however modest, should remind us of the dangers of maintaining bases in the region. The garrisoning of the Muslim holy land was a major recruiting tool for Al Qaeda and part of Osama bin Laden’s professed motivation for the 9/11 attacks. (He called the presence of US troops “the greatest of these aggressions incurred by the Muslims since the death of the prophet.”) Indeed, US bases and troops in the Middle East have been a “major catalyst for anti-Americanism and radicalization” since a suicide bombing killed 241 marines in Lebanon in 1983. Other attacks have come in Saudi Arabia in 1996, Yemen in 2000 against the USS Cole, and during the wars in Afghanistan and Iraq. Research has shown a strong correlation between a US basing presence and Al Qaeda recruitment. Part of the anti-American anger has stemmed from the support US bases offer to repressive, undemocratic regimes. Few of the countries in the Greater Middle East are fully democratic, and some are among the world’s worst human rights abusers. Most notably, the US government has offered only tepid criticism of the Bahraini government as it has violently cracked down on pro-democracy protesters with the help of the Saudis and the United Arab Emirates (UAE). Beyond Bahrain, US bases are found in a string of what the Economist Democracy Index calls “authoritarian regimes,” including Afghanistan, Bahrain, Djibouti, Egypt, Ethiopia, Jordan, Kuwait, Oman, Qatar, Saudi Arabia, UAE and Yemen. Maintaining bases in such countries props up autocrats and other repressive governments, makes the United States complicit in their crimes, and seriously undermines efforts to spread democracy and improve the wellbeing of people around the world. The Carter Doctrine’s bases and military buildup strategy and its belief that “the skillful application of US military might” can secure oil supplies and solve the region’s problems was, he adds, “flawed from the outset.” Rather than providing security, the infrastructure of bases in the Greater Middle East has made it ever easier to go to war far from home. It has enabled wars of choice and an interventionist foreign policy that has resulted in repeated disasters for the region, the United States and the world. Since 2001 alone, US-led wars in Afghanistan, Pakistan, Iraq and Yemen have minimally caused hundreds of thousands of deaths and possibly more than 1 million deaths in Iraq alone. The sad irony is that any legitimate desire to maintain the free flow of regional oil to the global economy could be sustained through other far less expensive and deadly means. Maintaining scores of bases costing billions of dollars a year is unnecessary to protect oil supplies and ensure regional peace—especially in an era in which the United States gets only around 10 percent of its net oil and natural gas from the region. In addition to the direct damage our military spending has caused, it has diverted money and attention from developing the kinds of alternative energy sources that could free the United States and the world from a dependence on Middle Eastern oil—and from the cycle of war that our military bases have fed.